A friend called to tell me he’d come by to deliver something. Seeing as it was close to dinner time, I asked if he’d care to stay for some food. The invitation was bashfully and promptly declined. He didn’t want to impose. He would, I was assured, drop off a package and, having an important event to attend right after, skedaddle. Moments later, the door bell rang as dinner was nearing completion. As it turned out, a few whiffs of an herb-laced fish roasting in the oven were all it took to derail someone’s plan. The visitor didn’t leave until this fish you see on the screen was stripped of its succulent flesh down to the bones. See this dish made by La Plus Petite Cuisine du Monde. Preheat the oven to 400°F. Line a baking sheet with a piece of foil, if desired. Grind turmeric, peppercorns, and cilantro roots into a smooth paste. Add salt and vegetable oil; mix well. Make a few slashes across the thickest part of the fish to allow the paste to flavor the fish more thoroughly. 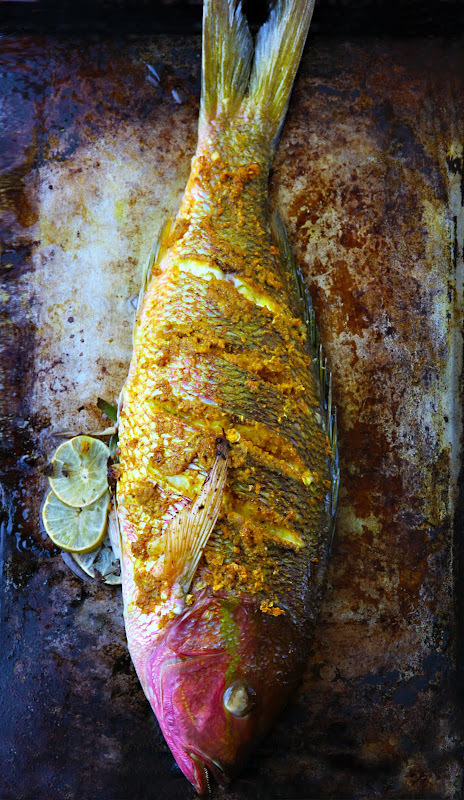 Rub the turmeric paste on both sides of the fish, going inside the slashes and all over the skin. Stuff the fish cavity with the fresh herbs. Bake for approximately 35 minutes or until the fish flakes easily. 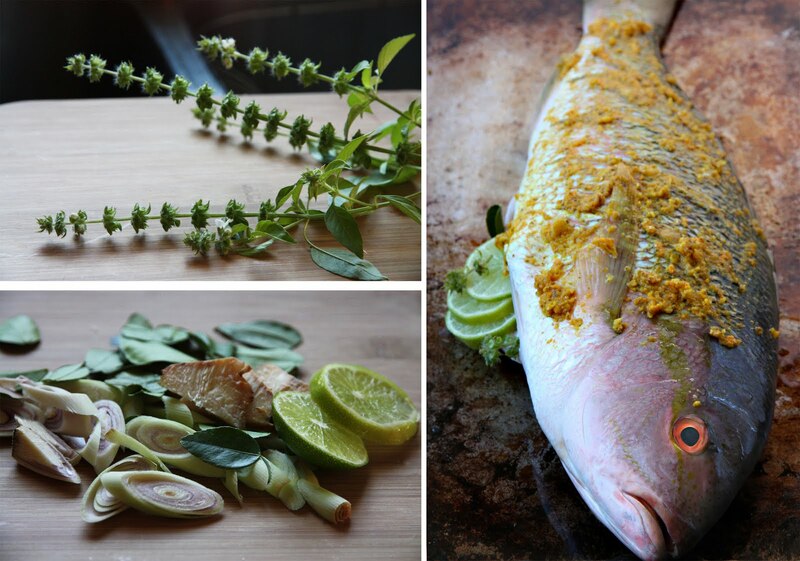 I serve my turmeric-roasted fish with coconut rice, but plain steamed jasmine rice will do. Oh, and don’t forget a small bowl of nam-pla prik on the side. Perhaps this would work with tilapia instead? i can’t blame your friend for delaying his plans after seeing this. this looks amazing. do you do your own scaling & gutting? When the kitchen smells good, how does one leave? A simple, easy and of course gorgeous presentation for any guest. May – It sure would. Is this at all like or inspired by the Hanoi turmeric dill fish specialty Cha Ca Thang Long? Nat – I’ve never had that. No, this is inspired by a recipe by a friend’s mother whose specialty is fish marinated in a turmeric paste similar to this, wrapped in banana leaves, and grilled. I would stay by too 🙂 This is so wonderfully flavored. I was thinking coconut rice as I was reading thru it, until I read you mentioned it too! If only I could convince my husband to eat fish with skin ! This is making me miss home . Oh this is really beautiful! I don`t mind with gutting fish but am not really into the scaling. Still, this turmeric fish look totally worth the effort! Arudhi directed me here to your blog for a recipe that I can use my fresh turmeric root with. I am so glad she did. You have so many wonderful recipes and I will be back here often. I really like the phtos too! I can’t wait to try this! For me, red snapper is one of the many rockfish with a reddish colouration back home – and yes, they are overfished. We usually call that fish yellow striped snapper here… it’s usually farmed (somewhere else). Also, have I mentioned I’m doing this the second we kill some trout for dinner? wow, the fish is so colorful and with those fragrant spices no wonder your friend was hypnotized! I would think that this would be wonderful on the grill. There is nothing better than a crispy grilled fish with all those flavors inside! I usually use a wire fish basket so you don’t use much skin. For those on the east coast, Porgies are a good substitute for Red Snapper. We tried this recipe last saturday, it was absolutely, positiveley marvelous. And we loved the Nam-pla prik with the steamed rice. Thank you so much for sharing your knowledge, we owe you one more happy moment ! Hi, what do you think about steaming the fish instead of roasting it? I live in China and don’t have an oven. This is the second time ive made your turmeric roasted fish, again a delicious and beautiful dish! Did the coconut rice too. This time our friend had speared some fresh bream. Was a beautiful way to cook it! Thank you.